Friesen, Gary. 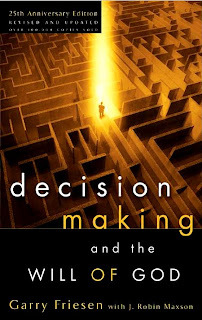 Decision Making and the Will of God . Lewis, C.S. Mere Christianity . MacDonald, Gordon. Ordering Your Private World . Packer, J.I. Knowing God . Stott, John R.W. Basic Christianity . ten Boom, Corrie. The Hiding Place . Yancey, Philip. What's So Amazing About Grace? I thought Mere Christianity was a "classic of the faith"
"Life...should be pebbled with principle..."
"Whoever would be great among you..."
Is freedom more trouble than it is worth? "No more a stranger, nor a guest..."
"We praise and thank you"
"Choosing the right college is over-rated"